We produced 30 interactive maps and over 10,000 Adobe PDF precinct maps leading up to the 2004 general election. Since then, we've updated the interactive maps with precinct-level data for California, Georgia, Minnesota, New Hampshire, New Mexico, South Carolina, Texas, and Wisconsin (plus Maine and Michigan townships). We'll add more states where we can find statewide precinct-level geographic databases that match the 2004 election results, but in most cases this is not possible. Some additional states may become available as the 2008 election approaches. Note that several other state map applications include 2002 through early 2004 precinct/precinct proxy voter data -- Arkansas, Florida, Maryland, Michigan, Missouri, North Carolina, Ohio, and Oklahoma. We've updated the interactive maps with party affiliation maps for Congress and state legislatures to reflect the 2006 election. 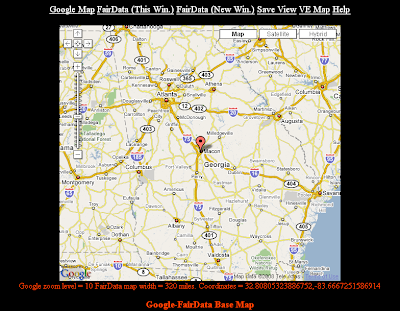 For example, click on the graphic below to use a Google Map as an entry viewport to the Georgia GOTV Mapper. Click on FairData (This Win.) or FairData (New Win.) to open the thematic interactive map. You can switch back and forth by clicking on the balloon icons (representing various zoom levels) beneath the map image on the FairData interactive map.